It has been an eventful week to say the least! The air was filled with growls and roars as the larger male of the coalition of three males is mating with another lioness. 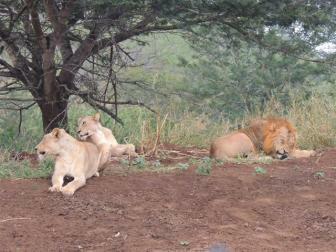 She will be the second lioness that he has mated within the matter of a couple of weeks. Needless to say we are all very excited to see what may come of it. As lions have a gestation period of around 110 days we will be keeping a watchful eye on them for the next couple of weeks. Yesterday our guests had the amazing opportunity to partake in a Rhino darting experience as three of our Rhino were darted to do ear notching and micro chipping of their horns. This is a very good initiative to get guests involved and up close in the fight for the protection of our Rhino. Rhinos also made for great sightings over the past week along with some breeding herds of buffalo. We were also fortunate to find a male cheetah on its fresh impala kill with black backed jackals calling in the vicinity. Guests on night drives were kept entertained with sightings of white tailed mongoose, spotted genet and many owls.